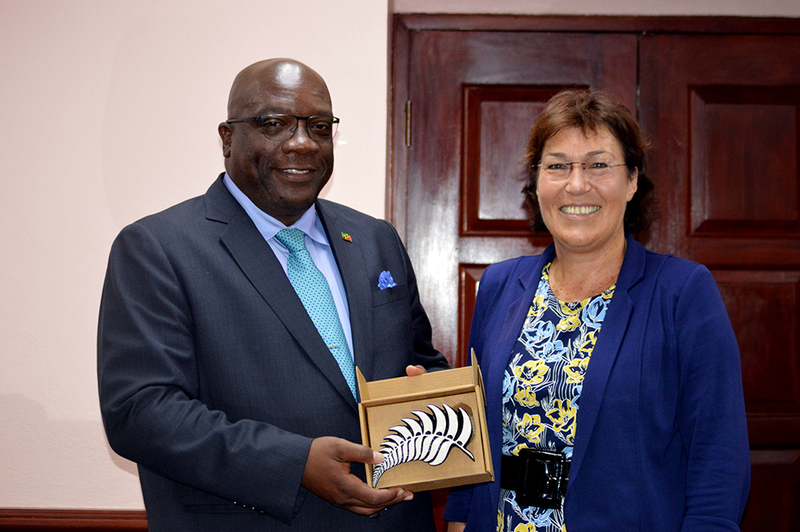 Prime Minister Harris showcases a gift presented to him by Her Excellency Jan Henderson. BASSETERRE, St. Kitts – Prime Minister the Honourable Dr. Timothy Harris bade farewell to New Zealand’s High Commissioner to St. Kitts and Nevis and Ambassador to CARICOM Her Excellency Jan Henderson, who has successfully completed her duties in the region. High Commissioner Henderson paid a visit on Prime Minister Harris at his office on June 4, where she reflected on her time spent working in the region and thanked the St. Kitts and Nevis prime minister for his support and cooperation during her tenure. Prime Minister Harris extended his own gratitude and that of the government and people of St. Kitts and Nevis to High Commissioner Henderson for her excellent work during her stint in the Caribbean and for the level of cooperation she extended on several issues of mutual interest. “I want to thank you for being a friend on whom we could rely because while you very faithfully pursued the agenda of your principles, you did so by bringing, I believe, a better understanding of the region,” he told her. “You [represented] your principles so that the policymaking became easier and was more sensitive to the region’s priorities. High Commissioner Henderson was the first New Zealand high commissioner to be based within the region.